The three Divertimentos for strings K136-138 (125a-c) have an unassailable place in the standard repertoire of any string orchestra. They are full of sparkling, dramatic and melancholy themes. In style they are clearly structured, but not without refinement. The dominant factor is brilliance of effect, which never descends into triviality. 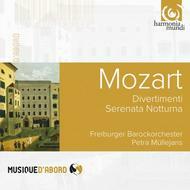 In short, we have here a compendium of the young Mozart�s liveliest and most enchanting string music. This title was released for the first time in 2004.